Home / News / Fearless! In announcing his endorsement, Joe cited my commitment, compassion, and courage in mounting a grassroots challenge powered by people. He also ran for office because he heard the call to serve, and said he admires my decision to leave my career as a reporter. I am so honored to have Joe’s support. I’m excited by the coalition our campaign is building and am truly motivated by all of your support from across the district and the city. Together, we will put our fearless campaign for healthcare and education in the State House! 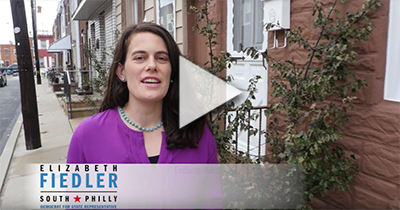 Elizabeth Fiedler is a dedicated community leader, former Philadelphia reporter, and first-time candidate for office. She lives in South Philadelphia with her husband and two young sons. She worked as a waitress and a fast food cashier and is deeply committed to representing the values of people — not the super rich and special interests.